St Albans Chamber Choir’s concert Festive Bach on Saturday, April 28 attracted such a large audience to St Saviour’s Church that extra chairs had to be put out. Escaping the cold and damp evening (and wall-to-wall snooker on TV), the music lovers of St Albans and Harpenden flocked to hear the choir, with Amici Voices and the Lawes Baroque Players, performing Bach cantatas composed for church services from Easter to Pentecost. Close your eyes and you could have been in Leipzig three hundred years ago, hearing music which is not only universal in its inevitable working out to a satisfying conclusion, but personal in its direct and joyful confirmation of faith. 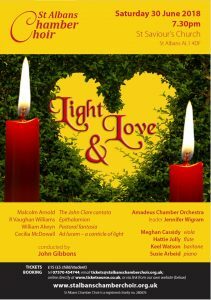 Musical director John Gibbons set a cracking and exhilarating pace throughout, emphasising the playfulness of the music. Bach can be fun. The performers were well up to the challenge. Amici Voices – Rachel Ambrose Evans, Helen Charlston, Hiroshi Amato and Michael Craddock – confidently and superbly provided the solo parts. The Lawes Baroque Players ably and securely underpinned the whole performance, with trumpets providing an extra flourish. The choir excelled throughout, showing their virtuosity in the demanding unaccompanied motet, Fürchte dich nicht, as well as in the joyful affirmation O ewiges Feuer. This must have lifted the spirits of everyone in the audience. Light & Love, will take place on Saturday 30th June at St Saviour’s Church at 7:30pm. With Meghan Cassidy, Hattie Jolly, Keel Watson and Susie Arbeid. Conducted by John Gibbons.